McFly is a British pop band who first found fame in 2004. 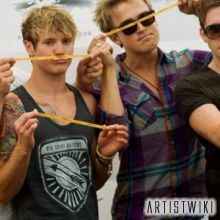 The band, formed in London, was founded by Tom Fletcher (lead vocals/guitar/piano) and also consists of Danny Jones (lead vocals/guitar), Dougie Poynter (vocals/bass guitar) and Harry Judd (drums). They have released four studio albums and had seven #1 singles. They were managed by Prestige Management, and were signed to the Island Records label from their launch (2004) until December 2007, before creating their own label, Super Records. McFly is also the youngest band ever to have an album debut at #1.